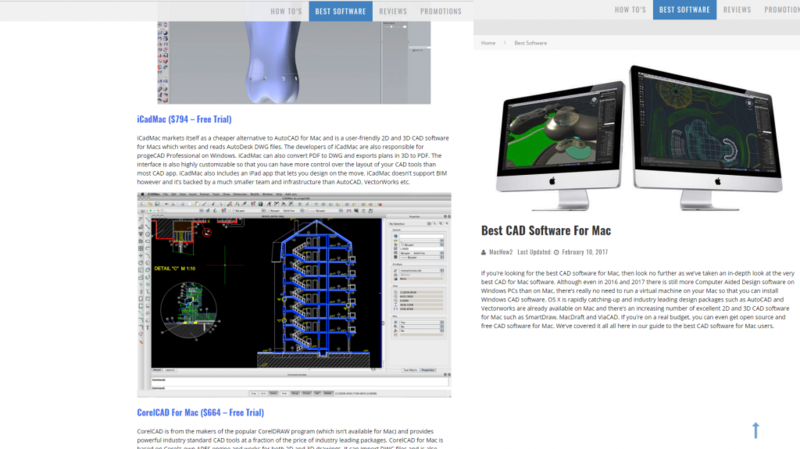 MacHow2, an online magazine specializing in Mac applications, recently made a careful assessment of CAD software for Mac. The upshot of it was that iCADMac, our 2D/3D DWG/DXF CAD package for Mac, came on the list of the best CAD software for Mac. At ProgeSOFT we couldn’t but share this news with you and we are grateful to MacHow2 for finding and adding our software to their top selection list. iCADMac’s presentation on MacHow2 begins with: “iCADMac markets itself as a cheaper alternative to AutoCAD® for Mac and is user-friendly 2D and 3D CAD software for Macs which writes and reads Autodesk DWG files”, while the full text of the overview is available here. iCADMac is a 2D/3D CAD application for MAC OS X using the DWG and DXF native formats, representing powerful, reliable, complete, easy-to-use and economic software. It’s a complete DWG CAD package offering a wide array of features and tools for 2D design and 3D modelling, a familiar interface, and compatibility with the design format most widely used throughout the world. iCADMac enables any user accustomed to AutoCAD® to start working with their DWG drawings using iCADMac without the necessity of any conversion and with no steep learning curve. ProgeSOFT invites you to download the free 30-day trial version available here. Keep on following us via YouTube Channel, more information on iCADMac is available on the official website. 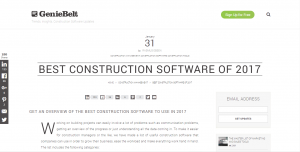 We’re honoured by being entered in a list on the renowned blog, GenieBelt, that has chosen progeCAD as one of the best construction software to use in 2017. The work on a construction project often involves problems in communication, the difficulty in data understanding, the facing of high costs and not only. GenieBelt had a brilliant idea to put together all useful software that may come in handy to companies interested in making their business grow easily and facilitating their workflow. progeCAD is on this list and will serve to help professionals in the construction industry in drawing and design of building projects as well as in technical documentation management, not forgetting significant improvements in collaboration with both team members and external clients. Feel free to read here the entire article. progeCAD, the 2D/3D DWG/DXF-native general-purpose CAD application, is recommended as one of the best design software for architects, engineers, designers and draftsmen. progeCAD, a low-cost alternative to AutoCAD® and AutoCAD LT®, has been enriched from version to version with new tools and plug-ins included for free and intended to satisfy the needs of its users. More information on progeCAD is available at the official website. 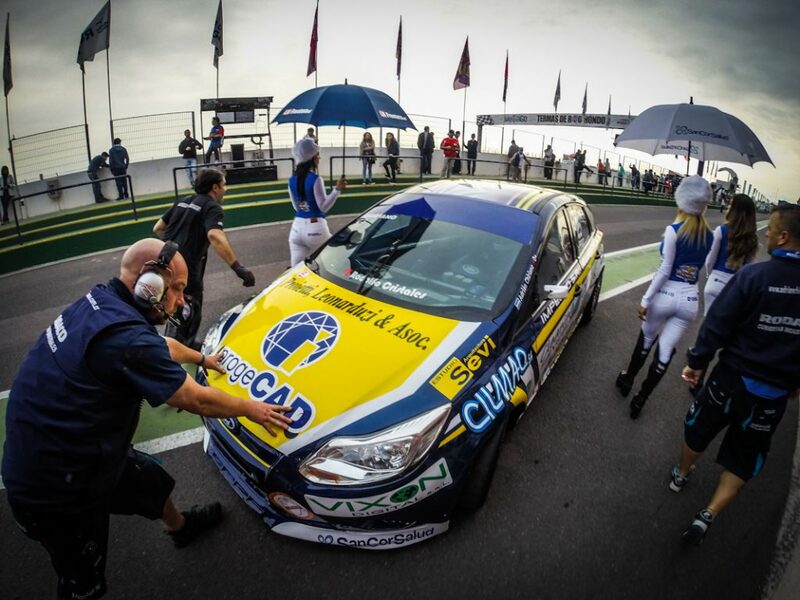 Adrián Chiriano, the rally racer sponsored by progeCAD Argentina, has recently finished Argentina’s National Tourism Rally Championship Class 3, the most watched and debated sporting event. Adrián Chiriano won the third place in the Viedma round and that allowed him to finish third overall in the final classification. It was already the first qualifying day held on Saturday that turned out to be positive for Chiriano who proved himself to be in good shape. He paved the way for success gaining good position in the starting grid, the second place and the third heat for the race of the following day. During the race Chiriano gave a hard time to his rivals, in the end giving way to Angelini who won the first title and Bosio who managed to finish in second. Chiriano had been struggling hard in an attempt to pass Bosio’s car to the bitter end. Adrián Chiriano took the third prize finding himself again on the third step of the podium with a Championship trophy in hand at the end of the race in the Viedma autodrome circuit the way it had already happened in the 2014 season. Argentina’s National Tourism Rally Championship Class 3 has come to an end with its completed 12 rounds which started last February and triggered animated debates involving the whole Argentine nation. “That’s the result of great work of the whole team […] I’m happy to end the year in this way”, Adrián Chiriano commented right after the competition. ProgeSOFT shares the ideas of the Chiriano team consisting in the constant commitment, determination and competence – the values which were also essential in the production of progeCAD, 2D/3D DWG/DXF CAD, a powerful and affordable software application for technical drawing able to replace expensive CAD products. To find more information on Adrién Chiriano as well as all updates on the upcoming events he takes part in, click here. For CAD devotees and auto rally supporters, ProgeSOFT is pleased to offer its software product, progeCAD 2017, for a free 30-day trial available here. All the videos and tutorials relating to the program are available in the YouTube official channel while the latest news can be found on facebook, twitter, linkedin and google+. The AN-Cad Solution Company, the ProgeSOFT Partner in Finland, is presenting progeCAD 2017 at the Tekniikka Exhibition in Jyväskylä from Tuesday, November 1 through Thursday, November 3, 2016.
progeCAD, the low-cost 2D/3D, DWG/DXF-native CAD software, will be one of the main attractions of the Finnish Stand at Booth B530. progeCAD offers complete DWG 2017 compatibility, a 64-bit version, multi-core Support, DWGConverter, the AutoCAD® look-and-feel and many other add-ons and features included in the package for free. An overview of progeCAD 2017 is available here. The Tekniikka Exhibition focuses on systems and services for measuring, analysing, controlling and adjusting the production processes. Visitors will be able to see machines, equipment and services suitable to several branches of industry on display at the exhibition. The target group consists of decision makers, professionals and engineers responsible for automation and production technology of various industries as well as the users of these technologies. The program is rich in seminars, workshops and conferences opened to all the visitors. All attendees are welcomed at Booth B530 where An-CAD Solutions will be readily presenting the progeCAD software introducing its functionality and suggesting most suitable licensing solutions to satisfy various needs. Announcements of all our initiatives can be found in our blog, feel free to follow our social pages on facebook, twitter, google+, linkedin.